Wednesday was one of those days in Colorado that nearly all conversations started with “it feels like Seattle, not Denver out there”. Topping out at 62 degrees F, Denver International Airport (DIA) set a new record-low high temperature, beating the previous record of 64 degrees F from 2009. That’s a whopping 28 degrees below average for the date, and a far cry from Seattle’s actual highs Wednesday in the upper 80s. We were also the coolest major city in the entire country. The soggiest days of the week are now behind us, but storms remain in the forecast off and on through the next week. A few showers this morning should taper off, with about a 20% chance for storms this afternoon. Temperatures will remain below normal through the period, though will warm back into the 70s and eventually possibly the 80s by the weekend. Rainfall totals, as expected, were pretty remarkable between Tuesday afternoon and Wednesday evening. 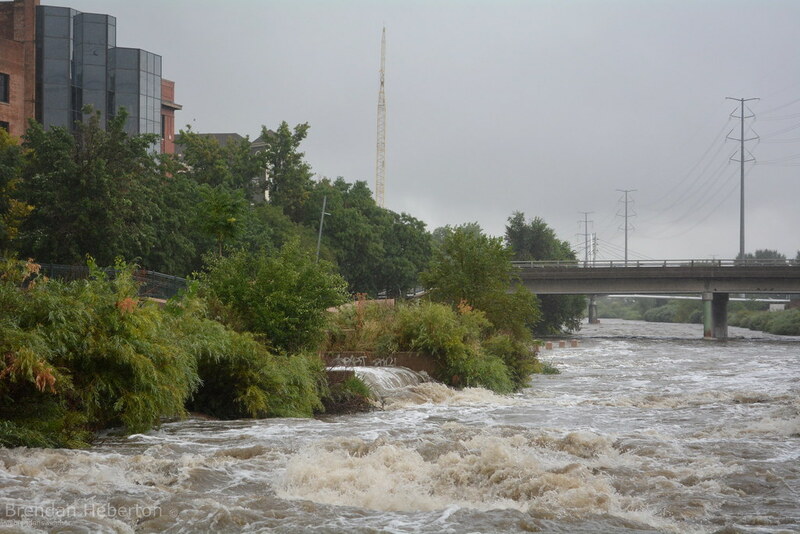 DIA officially recorded 2.90 inches of rain over the two day period, with 2.96 inches recorded at our weather station one mile south of the capitol in Denver. Coors Field received 2.86” of rain during the period. And, on July 29 (Tuesday) DIA set a new daily rainfall record when 1.80 of rain fell during the 24 hour period, beating the old record for the date of 1.44 inches set in 1989. On average, Denver sees 2.16 inches of rain in July. As of this morning 3.85 inches of rain have been recorded at DIA this month, or 1.69 inches above average. Here are a few other totals from across the state via the CoCoRaHS reporting network. 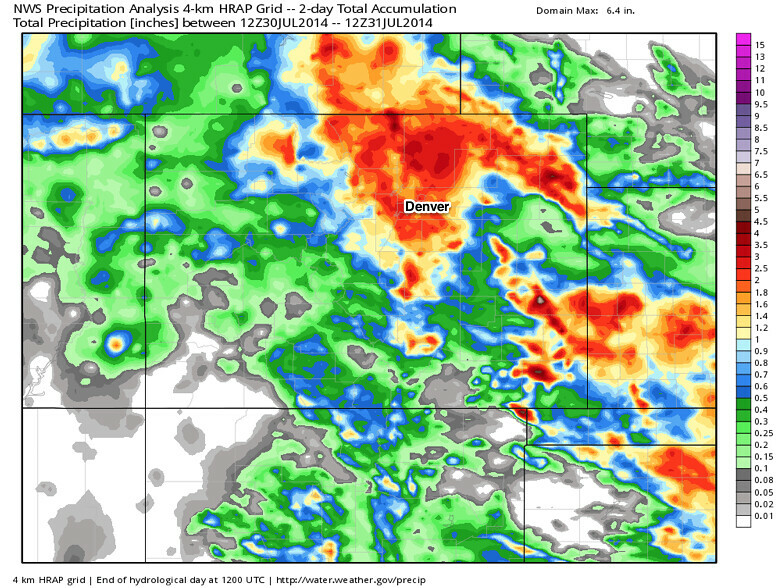 This map shows the two day NWS precipitation analysis (via WeatherBell) for Colorado. Very impressive totals across eastern Colorado, especially the northern and northeast portions of the state, and again over southeast Colorado. Totals in and around Denver largely ranged from 1 to 3.5 inches (as forecast!). Our chance for storms in the Denver area drops quite a bit for today, but can’t rule a storm or two. Afternoon highs will be much warmer than Wednesday, but still 10 to 12 degrees below normal with temperatures expected to top out in the upper 70s this afternoon. Storm chances will be lower yet this weekend, and temperatures will be warmer. With water-logged soil, it could take a few days to hit the 80s again. We’ll keep an eye on things as we head into next week, as overall our pattern stays pretty active with afternoon storms in the forecast almost each and every day.